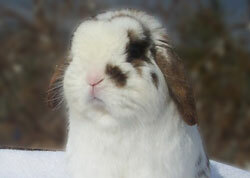 Note: this article was written for Holland Lops, but also applies to American Fuzzy Lops. 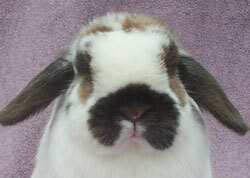 This rabbit has a desirable very round head. Look at that width between the eyes! It’s not a good idea for you or I to get “the big head,” but for our Hollands, it’s definitely a desirable trait. Most of us already know that. And there are some judges who think a huge head is everything. You’ve probably head about “headhunters.” But let’s put the “big head” into perspective today. First of all, points for Hollands are divided evenly between the head, ear, and crown (42), and the body, bone, feet, and legs (42), with the balance going to fur, color & markings, and condition. Although the number of points per characteristic has not changed from the last Standard of Perfection to the current one, the arrangement of the points has, presumably to emphasize that body and head are equally important. The moral is not to breed for heads only; you have to have a body, too. I got some advice early on from a prominent breeder that I think was very good. She said to get your bodies really well established before trying to improve your heads. She explained that when she tried to increase head mass too soon, she lost her hindquarters. I can see how that would be very easy to do. One of the most attractive qualities in a nice Holland is the “extremely short and well filled muzzle.” Mtn’s Doni (pictured right) has the shortest muzzle of any rabbit I’ve ever owned. It was so short that he couldn’t eat from a J-feeder without getting his forehead dirty! He is also a great example of width between the eyes. Speaking of width between the eyes, one of the flaws that can spoil good width is when it narrows toward the muzzle. The width can even narrow in the middle and widen back out at the muzzle. I saw that this past weekend. You want good width between the eyes all of the way up and down, from eyes to muzzle. One judge likes to measure the distance between the eyes and then the distance from crown to nose. The distance between the eyes should be as wide or wider. Otherwise, he will ding the rabbit for length in the face. He’s looking for balance. A Holland head should be round, with the exception of a little flattening between the eye and muzzle. Take a round piece of Playdoh and press it lightly against a mirror (you can clean that easier than the wall!). That’s the Holland head. If I have two Hollands with massive heads, but one is rounder while the other is more square, I’m going to focus more on the round head. This doe lacks some curvature to the forehead that would make her head nice and round. You don't want to see a pointy muzzle. I really haven’t heard much comment on the desire to have a bold eye on a Holland. 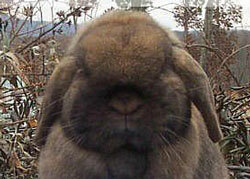 But I think we are naturally attracted more to rabbits with bold eyes. You will probably, over generations, select more for bold eyes without realizing it. 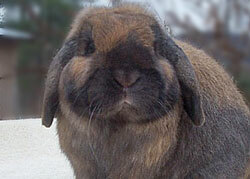 How large or “massive” should a lop head be, ideally? The last statement in the Holland lop standard for the head is, “The size of the head is to be in proportion to the size of the body.” Young bucks and all does seem to have this problem the most. I’ve have way too many does with cute, but small heads. One of my goals is to improve my doe heads. True, you cannot expect as huge a head on a doe as you can on a buck. And a doe with a smallish head does have some chance on the table. But I do want that head to balance. Bucks’ heads usually get bigger and bigger and bigger. That’s been one of the issues I’ve been dealing with in my rabbitry. No matter how aggressively I breed or how clever I may have been, I still am having to wait for those bucks to get some age on them. A very good head on a 9-month old can turn into an outstanding head on a 3-year old. Of course, it’s the opposite for those poor does. Their butts get bigger and their heads get smaller with every litter. Poor girls. Don’t forget the head mount! This doe has promising width between the eyes, but she lacks some at the muzzle and cheeks that would giver her a well-rounded head. She may get it with age. I have tried to pose rabbits and find them kicking their front feet out in front of them. Why do they do that? I think it is because when I put their head in the proper position, their front feet don’t touch the ground! I am trying to make them do something that is physically impossible. I try not to jump to that conclusion too quickly. A Holland should be given enough chances to eliminate the possibility that they are panicking because they don’t know what is going on. They should be given the chance to get the hang of it. But I do not believe that head mount (or posing) should be a learned behavior. It should mostly be a matter of the physical arrangement of the rabbit. Of course, handling and posing the rabbit so that you get easy cooperation is a desirable thing, but it is not a substitute for a physically correct rabbit. I wish you many big heads with the nice bodies to go with them. 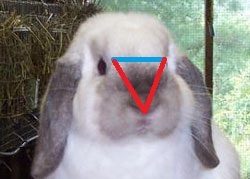 Some people like to imagine a triangle on a Holland or Fuzzy Lop’s face, like this. The length of the crosspiece between the eyes should be equal to or greater than the length of the eyes to the muzzle. This rabbit has a head that is too narrow. In contrast to the rabbit at the left, check out the massive appearance of this buck’s face. This is what you want.